To apply for the Emergency Home Repair Program, please complete the following steps. Print and fill out both forms. To avoid delays in processing your application, please write legibly, fill in all the blanks, and sign and date your application. Income Verification: This may be a copy of your benefit statement or award letter, a copy of your check or check stub, or your most recent tax return. Homeownership Verification: This may be a copy of your deed, a copy of your most recent tax bill, or a copy of your title if you own a mobile home. 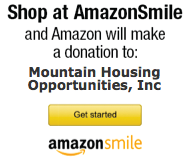 Mail your application back to us: Mountain Housing Opportunities, Inc., PO Box 2278, Asheville, NC 28802. For assistance, please call 828-254-4030.